The distant dwarf planet that Dawn is circling is full of mystery and yet growing ever more familiar. Ceres, which only last year was hardly more than a fuzzy blob against the stars, is now a richly detailed world, and our portrait grows more elaborate every day. Having greatly surpassed all of its original objectives, the reliable explorer is gathering still more data from its unique vantage point. Everyone who hungers for new knowledge about the cosmos or for bold adventures far from Earth can share in the sumptuous feast Dawn has been serving. One of the major objectives of the mission was to photograph 80 percent of Ceres’ vast landscape with a resolution of 660 feet (200 meters) per pixel. That would provide 150 times the clarity of the powerful Hubble Space Telescope. Dawn has now photographed 99.8 percent with a resolution of 120 feet (35 meters) per pixel. This example of Dawn’s extraordinary productivity may appear to be the limit of what it could achieve. After all, the spaceship is orbiting at an altitude of only 240 miles (385 kilometers), closer to the ground than the International Space Station is to Earth, and it will never go lower for more pictures. But it is already doing more. Dawn is also earning extra credit on its assignment to measure the energy of gamma rays and neutrons. We have discussed before how the gamma ray and neutron detector (GRaND) can reveal the atomic composition down to about a yard (meter) underground, and last month we saw initial findings about the distribution of hydrogen. However, Ceres’ nuclear glow is very faint. Scientists already have three times as much GRaND data from this low altitude as they had required, and both spectrometers in the instrument will continue to collect data. In effect, Dawn is achieving a longer exposure, making its nuclear picture of Ceres brighter and sharper. In December we explained how using the radio signal to track the probe’s movements allows scientists to chart the gravity field and thereby learn about the interior of Ceres, revealing regions of higher and lower density. Once again, Dawn performed even better than expected and achieved the mission’s planned accuracy in the third mapping orbit. Because the strength of the dwarf planet’s gravitational tug depends on the distance, even finer measurements of how it varies from location to location are possible in this final orbit. Thanks to the continued smooth operation of the mission, scientists now have a gravitational map fully twice as accurate as they had anticipated. With additional measurements, they may be able to squeeze out a little more detail, perhaps improving it by another 20 percent before reaching the method’s limit. Dawn has dramatically overachieved in acquiring spectra at both visible and infrared wavelengths. We have previously delved into how these measurements reveal the minerals on the ground and what some of the interesting discoveries are. Having already acquired more than seven times as many visible spectra and 21 times as many infrared spectra as originally called for, the spacecraft is adding to its riches with additional measurements. We saw in January that VIR has such a narrow view that it will never see all of Ceres from this close, so it is programmed to observe features that have caught scientists’ interest based on the broad coverage from higher altitudes. Dawn took this picture on Feb. 16 (eight days after the picture above) at an altitude of 240 miles (385 kilometers). 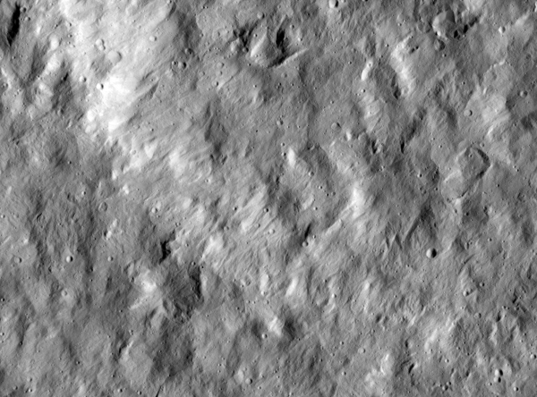 It shows a region northwest of Occator Crater, site of the famous bright region (which may become one of the most popular tourist destinations on Ceres). (You can locate this area in the upper right of the mosaic shown last month.) Compare the number and size of craters in this scene with those in the older scene above showing an area of the same size. There are fewer craters here, because the material ejected from the impact that excavated Occator resurfaced the area nearby, erasing the craters that had formed earlier. Because Occator is relatively young (perhaps 80 million years old), there has not been enough time for as many new craters to form as in most other areas on Ceres, including the one shown in the previous picture, that have been exposed to pelting from interplanetary debris for much longer. Full image and caption. Dawn’s remarkable success at Ceres was not a foregone conclusion. Of course, the flight team has confronted the familiar challenges people encounter every day in the normal routine of piloting an ion-propelled spaceship on a multibillion-mile (multibillion-kilometer) interplanetary journey to orbit and explore two uncharted worlds. But the mission was further complicated by the loss of two of the spacecraft’s four reaction wheels, as we have recounted before. (In full disclosure, the devices aren’t actually lost. We know precisely where they are. But given that one stopped functioning in 2010 and the other in 2012, they might as well be elsewhere in the universe; they don’t do Dawn any good.) Without three of these units to control its orientation in space, the robot has relied on its limited supply of hydrazine, which was not intended to serve this function. But the mission’s careful stewardship of the precious propellant has continued to exceed even the optimistic predictions, allowing Dawn good prospects for carrying on its fruitful work. In an upcoming Dawn Journal, we will discuss how the last of the dwindling supply of hydrazine may be used for further discoveries. In the meantime, Dawn is continuing its intensive campaign to reveal the dwarf planet’s secrets, and as it does so, it is passing several milestones. The adventurer has now been held in Ceres’ tender but firm gravitational embrace longer than it was in orbit around Vesta. (Dawn is the only spacecraft ever to orbit two extraterrestrial destinations, and its mission would have been impossible without ion propulsion.) The spacecraft provided us with about 31,000 pictures of Vesta, and it has now acquired the same number of Ceres. Thank you, ToSeek. It is too premature to comment on that. I will mention, however, that I've seen comments on this website and elsewhere about the possibility of Dawn going to Pallas. I've pointed out in answer to such comments that that rumor was never well founded. The Dawn flight team has never conducted studies of going to Pallas. Thank you for your nice comments, Jonathan. There are some observations that appear to be consistent with cryovolcanic processes, but there is no definitive determination (yet). There is a great deal of effort being devoted to translating Dawn's data into an understanding of Ceres' past and present geological activity. As these results become available, we will continue to release them. We also will continue on the Dawn website with our featured image of the day as well as occasional other releases. But all of our Ceres images from the primary mission (which ends on June 30) will be released before the end of the year (just as all of the Vesta images are now publicly available). If Dawn moves on to another target, it will need to be one that requires only a very small Delta-V to reach. I do not think there are any big suitable asteroids, but probably plenty of smallish ones. I specultae this idea is to be a flyby of a small target, planned to do as much with the last two reaction wheels as possible. Thanks for your reply Dr. Marc. By the way, is that likely that Bright Spot in Occator and Haulani crater comes from the subsurface ocean through volcanic eruption? Haze that appear on Bright spot 5 indicates that the bright spot might be ices, but data recently indicates that they are a kind of salt, so what is the haze that we observed before this? If it is giant salt dome left over after the sublimation of ices, bright spot should comes from salty ocean beyond Cererian surface, could it become the best place on Ceres that search for extraterrestrial life? Jonathan, the process by which briny water makes its way to the surface is not well understood, but it's doubtful it was a volcanic eruption. This is an area of active research now. The fractures visible in Occator suggest a possible conduit. (You can see them in the pictures in my March Dawn Journal, which for technical reasons on this site likely was missed by most readers. Search for "Resplendawnt.") The bright region in Occator certainly would be a promising place to look for prebiotic chemistry, and it may indeed turn out to be the best. There is still a great deal of work to do in order to understand the data we have acquired. @ToSeek; last month in New Scientist [20 April 2016, NASA’s Dawn probe may visit third asteroid after Ceres and Vesta], there was a report that Dawn might visit another asteroid but which asteroid was not mentioned. I do hope that the mission extension gets the go ahead because then we'll get a third set of excellent data, discoveries and pictures. Dear Dr. Rayman, I still think your DAWN mission is one of the best planetary exploration mission in the whole history of NASA. Ceres is much more interesting than our Moon and Mars so far. It is still hiding many of its secrets from DAWN. Since DAWN is now low on hydrazine, your team must have some other big plan on how to spend the rest. I really hope you can work out an orbit that will always traverse over the top of OXO. This is the only permanent opening left on Ceres. A periodic observation over the crater may yield data about the changes of water vapour volume as well as light intensity level. Moreover, we need to see more dark side photos of OXO. Without sunlight interference, you can better observe the intensity variance of the internal light source of CERES. There must be a very interesting core reaction going on inside Ceres. The chemistry inside Ceres may inspire the creation of new energy source for space travel. A planet so small, and yet it has the potential to transform the understandings of our solar system as well as the universe. Planets/moons in the cold regions of our solar system can still have a spontaneous active core. Fascinating indeed ! Thanks for your kindly reply again Dr. Marc. Nearly three weeks after Dawn team sent NASA a proposal for extended mission, but no further news about it until today, I'm worried about "did NASA rejected the extended mission?" or "when NASA approve the mission, there are no fuel left to the third asteroid". Please forgive ignorance of me that never worked for NASA before, did NASA typically need long time to make a decision? Thanks for your reply Dr. Rayman. 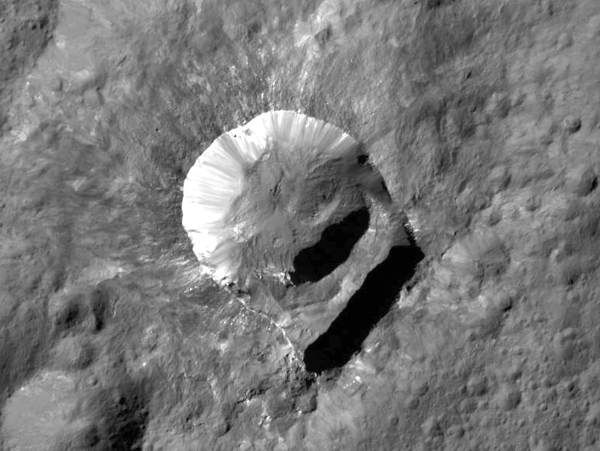 I know it is a challenging task to position a particular feature on Ceres. The reason that I am bringing up this topic again is because you had mentioned DAWN has detected unique substance existed on OXO, not found in anywhere else. If DAWN had spent 1 to 2 months on a periodic orbit passing Occator last year, DAWN may actually photograph a series of pics showing the "self-healing" progress of Occator. This might have helped your team to understand how the internal material filled up the holes. So far, over 95% of Dawn's photo are ordinary craters and only about 5% of the terrain have significant interests. If Dawn can proceed to a coplanar orbit that will go around Ceres among Occator, Oxo and one other point of interest. , then your team "may" get more insight for the remaining time left on DAWN's mission. In the occurrence of another future impact event, DAWN will be able to detect more water vapour coming out from OXO or even seeing a raised level in the middle of Occator. The gel-like material may not have hardened underneath Occator. A peak can be formed if there is a sudden surge of internal pressure. Anyway, I am just brainstorming some wild ideas for everyone to discuss. Whether it is feasible or not, it is beyond my ability. 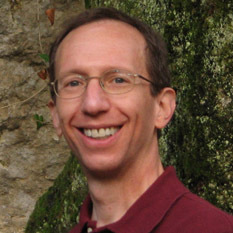 Dr. Marc: Any information/hypotheses about the 3 GRaND-detected energetic electron bursts reported by NASA/JPL on September 30, 2015? Any further bursts detected? Sean: Scientists have been working hard to analyze these three intriguing detections, and a paper with the preliminary results is awaiting publication now. When it is published, the results will be publicized. A recent report regarding the detection of electron bursts on Ceres is available. Please search for this document on the Internet and read about it - 47th Lunar and Planetary Science Conference (2016) 1687.pdf. If what the paper said is true, then we can safely assume that Ceres has a molten core and conductive layers. This is consistent with the theory of a salty liquid layer underneath the crust. There are complex chemical reactions occurring at different depths near the MgO plasma core. The material discovered on OXO are light-weight by-product formed near the viscous ocean surface. 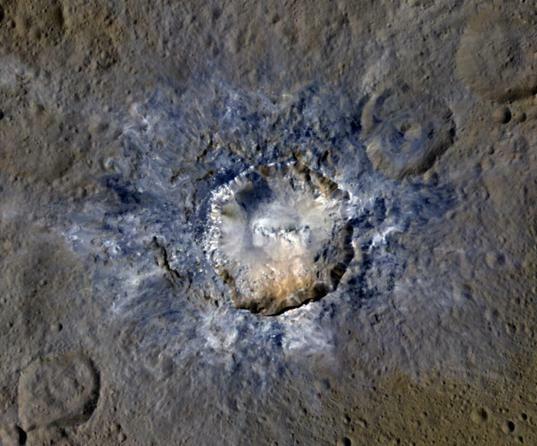 This material can surge toward the ceiling forming strain fibers and crystals, leaving behind layers and layers of splatter-net underneath the crust of Ceres. We can see shadows of these splatter-net on the recent photo of Occator crater. ScienceNotFiction: I was referring to a peer-review paper that includes scientific analysis and results. I'm sorry I wasn't clear. Regarding colors and reflectivity variation on Ceres Colors and reflectivity vary over a Ceres rotation period. These color variations over a rotation period could readily be compared to the color variations that would be caused by a similar temperature change on a system like magnesium metal dissolved in liquid ammonia, Mg/NH3(liquid). Metal/ammonia solutions are blue at low metal concentrations and have a metallic bronze shine at hight metal concentrations. Variations in colors by changes in metal concentrations have been observed in chemistry labs for over a hundred years. We measured their low densities back ca 1967. After a close examination of the "conduits" (liana/root-like material) on PIA20350, I believe the phyllosilicate minerals associated with these features are most likely kaolin Al2Si2O5(OH)4 (as well as metakaolin) and Lizardite - Mg3Si2O5(OH)4. When you zoom into PIA20350 over the surrounding dark cracks/fractures, you can see mini root-like conduits connecting alone the long gaps. They are formed by crystallization while the materials are still in a viscous mixture from inside Ceres. Below 100 °C , exposure to dry air will slowly remove liquid water from the kaolin. The low surface temperature of Ceres helps to speed up this process. Depending on the geometric configuration of the phyllosilicate, elongated growth of crystals will also form rapidly. Many of the root-like conduits resemble the mineral deposits of Kaolinite and Lizardite except in a much larger form. Of course, there are many other types of phyllosilicates on Ceres. I think kaolin and metakaolin are very likely. They can form complex amorphous structure and continuous hydroxyl loss occurs during dehydration and water is formed. Based on my MgO plasma core hypothesis, there are many levels of chemical reactions occurring at different depths toward the core at a whole range of temperatures. The density of each reactant, product and by-product will interact during forward and reverse chemical reaction. There are definitely layers upon layers of liquid and gas chemical compound surrounding the plasma core. The lower density substances will rise toward the surface while heavier ones will sink toward the hot plasma core for the reverse chemical breaking down processes. Thus, Ceres' internal liquid is constantly maintaining a multitude of reaction equilibriums among all sort of chemicals. Ammonia, HCL, porous clay, hydrogen, and water are just some of the stuff that floats on the surface of Ceres' internal ocean. The supersaturated=superhydrated salty ocean can generate an enormous amount of crystalline structures underneath forming the basis of Cerean crust for over the 4 billion years. My question is how to achieve a spontaneous MgO plasma core in space. IDENTIFYING THE FIBER MATERIAL IN AND AROUND OXO ??? In 2015, I have long speculated the abundance of talc (clay mineral) as one of the main composition of Ceres' crust. It is obvious to assume that many related minerals would have to exist below or on its surface. Tremolite, a type of naturally occurring asbestos mineral, is a good candidate for our identification of such fibrous material surrounding OXO ("the slumping hatch"). Tremolite is made up of calcium, magnesium, silicon, hydrogen and oxygen. The Cerean ocean can provide all of these necessary elements for forming tremolite crystal fibers. It can be in different color due to impurities, including brown, gray, white or green and may appear to be semi/transparent. On PIA 20360, many fibrous strains have extended outward of OXO, connecting the surrounding surface forming a blanket of fibers. Tremolite asbestos is one of the strongest and flexible asbestos which can be woven for fire resistant applications. Tremolite's chemical formula (Calcium Magnesium Silicate Hydroxide) also provides us the clue to why it can grow near OXO. The CaO, MgO, SiO2 and H2O undergoes "contact metamorphism" for millions of years. From the picture of OXO, scientists should be able to speculate the actual age of these tremolite fibers by their lengths, thus deriving a better age estimation of OXO. 5CaMg(CO3)2 + 8SiO2 + H2O ------> Ca2Mg5Si8O22(OH)2 + 3CaCO3 + 7CO2 Since asbestos is harmful to animals and human, any future manned-mission to the surface Ceres would require extensive decontamination procedure on the space suits. There may be more harmful substances inside Ceres than we would have thought. Dear Dr. Rayman The Ceres Dawn science team found evidence for ammonia(NH3) rich clays and magnesium sulphate(MgSO4) salts on Cere's bright spots surface. Relative to these bright spot findings the following could be of interest. Daytime surface temperatures on Ceres, span from -136 to -28 F. Mg-NH3 liquid solutions are stable at theses temperatures. They also undergo a phase change from liquid ionic to liquid metallic dependent on the metal concentration in the ammonia. They are blue at low concentrations and show a bright metallic reflection at high metal concentrations. At intermediate concentrations temperature affects on the phase separations would cause the color changes as have been observed day to day scale.. That the newest craters would have the brightest spots in in the overall decay process. We all anxiously await the publication of the Ceres team findings. The Origin of Magnesium Sulphate ??? Based on my MgO plasma core assumption, the MgSO4 is derived from Magnesium carbonate (MgCO3 or Magnesite) reacting with Sulphuric Acid H2SO4. The abundance of MgCO3 in the viscous ocean of Ceres is highly probable. Because MgCO3 decomposes into MgO and CO2 at 350C. The anhydrous salt is practically insoluble in water and have a higher density of 2.96g/cm3 versus the trihydrate form of 1.84g/cm3 , The anhydrous salt will sink toward the plasma core until it is completely decomposed into MgO (fuels the plasma core) and CO2, and the hydrates floats toward the ocean surface which reacts with the sulphuric acid layer (which also has a density of 1.84g/cm3).The resulting heptahydrate of MgSO4 will have 1.68g/cm3 density. This imply that the surface layers of Cerean ocean should have a density of at least 1.84g/cm3. It is also acidic. By mapping the density of all possible solutions, scientists can easily come up with a basic model of Ceres' ocean chemical composition. The weak gravity of Ceres will cause more distinct levels of chemical separations at various depths. To Dr Rayman, ScienceNotFiction, MarsMargot) - - - - - - - - - - - - - - - Thank you ScienceNotFictionfor your response. My comments are all relative to the Ceres surface where bright spots with changing forms are seen to vary on a daily bases and at daytime surface temperatures said to span from -136 to -28 F. Relative to these surface bright spots the following may be of interest if they were caused by magnesium-ammonia solutions. Their properties, known on earth as low density liquids, would raise them up to the Ceres surface. They yield a brightly metallic reflection at high concentrations and dilute solutions are blue. Temperature changes on Ceres surface and decay reactions would cause variations in there shapes and brightness and changes on a daily bases. Natural decay processes would have them darken and likely yield (the tentatively observed) magnesium and ammonium substrates. Most of all the youngest craters would be the brightest since these solutions darken as they decay. Thanks Dr Rayman, we all anxiously await the publication of the Ceres team findings.